Sydni Deveraux has answered my 2013 pre-BHoF Q&A, and she will take to the stage in a matter of weeks at the Burlesque Hall of Fame Weekend 2013. I put something lighthearted and fun together this year, and requested some extra ‘media’ from each contender. When I’m on stage, I feel… Whole. Electric. I feel multiple possibilities. BHoF is special and important to me because… it’s the ultimate celebration of our legends, and it’s Mecca for strippers! It’s where I decided to keep performing at a time when I wasn’t sure if the art had what I needed. I chose the act I am competing with because… it’s fun and shows off my abilities as a musician. 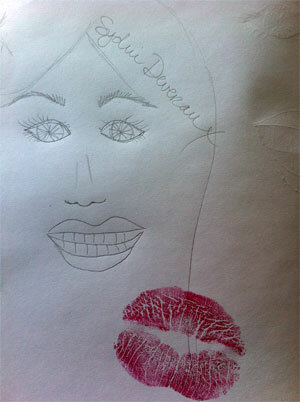 A kiss and a doodle from ©Sydni Deveraux. If I am crowned Queen… I would hope to further the history of burlesque and make it more visible to more people. It would also be an honour to be the first crowned African-American queen. Something that few people know about me is… I’m an introvert. I am happiest when… I am dancing, performing, singing, with my husband, travelling, petting my puppies, creating new costumes, organising something, doing yoga. My greatest strength is… my mind. My biggest vice is… I used to have a few… I couldn’t say now. Maybe champagne. My greatest fear is… ha! You’re not going to get that from me today. If I could spend a day with any woman in history, past or present, it would have to be… Audrey Hepburn. I if could have a superhero power, it would be… the power of persuasion. With that, ANYTHING is achievable. The best piece of advice I have ever been given is… “Tell yourself that you love yourself every day and your life will change.” And it did. If I could only watch one movie, hear one song and read one book for the rest of my life, they would be… Movie: White Christmas, Song: Miles Davis’ All Blues, Book: Dracula or a Sherlock Holmes anthology. The key to show-stopping striptease is… a mega-watt smile, and knowledge of how to use your body. My hopes for the future of burlesque are… more opportunities for travel, bigger budget shows, fair pay for talent, and a bigger, broader audience.